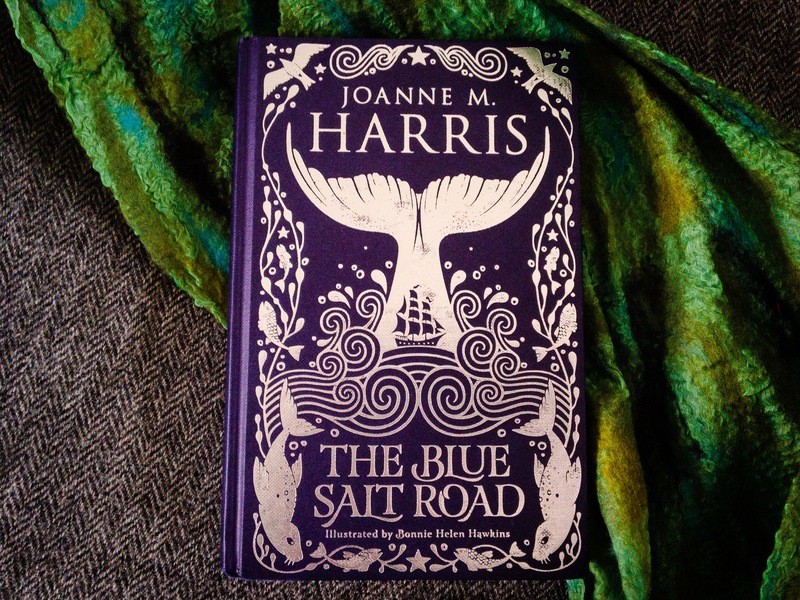 With Selkies, adventures and ballads, we took a look at Joanne M Harris’ beautiful book illustrated by Bonnie Helen Hawkins. The best way I can describe Harris’ writing is bardic, echoing the traditional ballads she so frequently quotes, creating three-dimensional characters with believable motivations and desires while retaining that characteristic folkloric, reflective distance from the narrative. It’s a distinctive style, making her stories without seeing the cover. I particularly liked her use of old ballads and folklore, as it gave the story a historic feel. One of the best things about this book was the addition of Hawkins’ illustrations. It’s rare in most publications for adults that you get such beautiful illustrations to accompany the text. However, there is something magical about images accompanying the words of the story; they help to expand your imagination. The only improvement I can suggest is for some expansion into the minor characters because I just felt as though characters like the lighthouse keeper had more of a story to tell. Overall, I can’t but recommend this book. For me, it was short and sweet, creating the perfect break between university work. As an easy read, its escapism offered a few hours of quiet. What more do you want from a university book club read? I couldn’t put this book down. It’s perfect for those snowy January days when your bed is too comfy, and the house is too cold. The folktale style is reminiscent of childhood bedtime stories, but this false sense of security only serves to enhance the brutality in the story. The fabled man of the Selkie greets you, dreaming of walking on land in his human aspect. So it is only natural that he partners with someone equally wild. Enter Flora, a fiery redhead with an all too familiar ambition, but ambition must always meet its fair share of blockades. How does one tame the untameable? Flora’s determination and cunning works hard to create her ideal life, leading to an ending that is ultimately predictable, but enjoyable and frankly deserved. The story’s subsurface brutality creates a tidal surge of momentum so that before you know it you’ve been reading for three hours, and your reading for tomorrow’s lecture has been abandoned. I think we can all afford to lose ourselves in a book every so often. – But as a side note, I wasn’t expecting cannibalism. Harris’ work has made me love mythology even more than I already did. This story starts innocently enough, sounding like something out of a child’s fairy tale; but a few chapters in the narrative became deeply disturbing. It sets the bar pretty damn high for harrowing stories. Using selkies, mythical humanoid creatures who wear the skin of seals to transform into one was overall quite wholesome compared to other monsters from folklore. In a remarkably short space of time, Harris successfully managed to draw me in and break my heart; any author capable of doing that in such a relatively small novel deserves credit, begrudgingly or not. I did know the rough narrative before reading this novel; I heard a spoken word version of it at a festival over summer. That particular version of the story was a lot more cheerful, I have to say, and it made the realisation of what Harris’ version of the story would entail all the more striking to me. I would recommend this book, but only if you’re up for a psychological trip.